Winter greenhouse crop cultivation is becoming increasingly popular in places like northwestern China. However, compared to the summer season, the quality and quantity of such production is often much lower due to reduced levels of light intensity experienced during the winter months. Desiring to assist farmers to optimize yields during this less productive time, Li et al. (2017) set out to investigate the interactive effect of elevated CO2 and supplemental light intensity on hot pepper (cv Meite). In doing so, they grew peppers from seed to maturity in plastic pots in a climate-controlled phytotron under two light intensities (normal and supplemental, the latter doubling the intensity of the former) and four CO2 concentrations (400, 550, 700 and 900 ppm). And what did their experiment reveal? Both elevated CO2 and supplemental light improved the growth and yield of the peppers. With respect to the impact of CO2, at elevated concentrations it increased leaf net photosynthetic rates in normal winter light by 37, 68 and 99 percent in the 550, 700 and 900 ppm treatments (relative to the ambient 400 ppm treatment, see figure below). Slightly smaller enhancements were noted in plants growing in the supplemental light treatment, where leaf net photosynthetic rates rose by 28, 44 and 72 percent (compared to ambient, see figure below) in the 550, 700 and 900 ppm CO2 treatments, respectively. 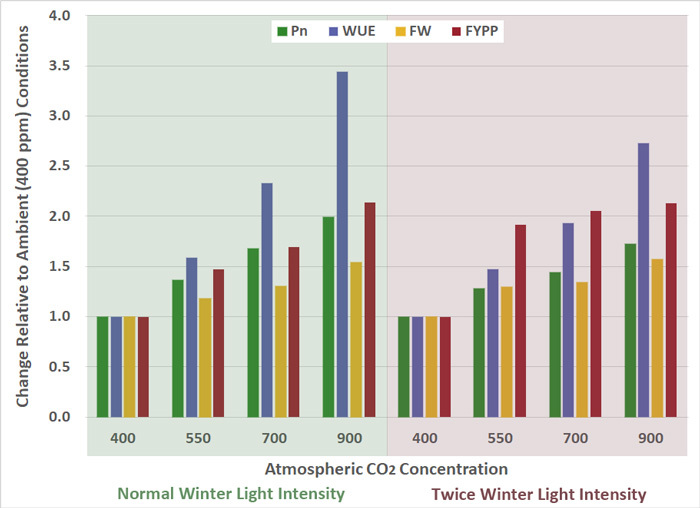 Other benefits of CO2 enrichment included significant increases in plant water use efficiency (from 59-244% under normal winter light and from 47-173% under supplemental light, see figure below), individual fruit weight (from 18-54% under normal winter light and from 29-57% under supplemental light, see figure below) and the total fruit yield per plant (from 47-114% under normal winter light and from 92-113% under supplemental light, see figure below), as was the fruit number per plant (from 58-81% under normal winter light and from 45-58% under supplemental light) and fruit volume (from 2-30% under normal winter light and from 49-51% under supplemental light). Given these several findings, it would appear that rising atmospheric CO2 concentrations will lead to important yield and water use efficiency increases in hot pepper, even under low light intensities. Figure 1. Impact of elevated CO2 on leaf net photosynthetic rate (Pn), water use efficiency (WUE), individual fruit weight (FW) and fruit yield per plant (FYPP) of hot peppers growing under normal winter light intensity and supplemental light that was twice the amount of normal winter values. Source: Li et al. (2017).